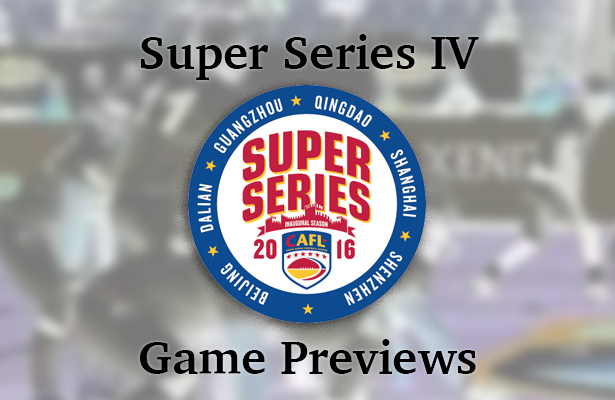 It is week 4 of The Super Series 6-team, 6-city tour, with Guangzhou the site of all three weekend games. Guangzhou is also in the line of site of a typhoon heading up the east coast of China. As of now, it looks like the city may dodge the typhoon. Dalian’s Dragon Kings (0-3) hope they can dodge the offensive storm that has been the Beijing Lions (3-0). Heavily favored, Dolezel’s undefeated team can feel pretty good about a spot in the China Bowl with their fourth win. His quarterback Luke Collis is the CAFL’s most efficient hitting on 72% of his passes for an average of 24 completions, 225 yards and 5 touchdowns per game. The Lions offense has score on 78% of their possessions. He has the CAFL’s best possession receiver in US all-star CollinTaylor. Dolezel chose to build his team inside – out however, and the Lions teeth can be found in their interior lines, lead by Neal Tivis on the attack. Dalian showed great improvement in their second game, and was off to a good start in their third, when they lost two key starters to injuries on consecutive plays, and faltered after that. Look for Phillip Garcia, a running qb, to step into the starter role this week for young enthusiastic coach Terry Bates. Dalian badly needs a win, and that is something of which Dolezel must be wary. Two old friends and colleagues from the United State arena leagues will square off in this battle that is likely a launching pad to a spot in the CAFL Championship game. Qingdao and Shanghai come in with identical 2-1 records. The Skywalkers of Stingley seem to be on the uptick after an impressive win last weekend versus Shenzhen, with a trio of US offensive stars sharing the spotlight in an aerial circus. QB Shane Austin, who leads the CAFL in total passing yards, keyed a spectacular night by splitting receiving honors between Mike Washington (5 tds, 140 yards) and Shawn Kauleinamuku (4 tds, 129 yards.) They are a trio unlike any in the CAFL. Qingdao struggled with their offensive weapons in a loss to a strong Beijing team last week. Wide out Reggie Gray sat out most of the first quarter, still hobbled by injury. In his absence, veteran QB Bryan Randall had few options, except for tall strong receiver Xavier Boyce, whose two circus catches, along with a impressive second half performance featuring defensive ends Jake Metz and Matt Mason made it a tight game until the final 3 minutes. Both teams badly need this win, and the game, which figures to draw the biggest crowd of the weekend, and also figures to be the Super Series IV’s best match-up. An intriguing matchup. Anytime the Naja take the field in the Super Series people notice. Coach JW Kenton has introduced the shotgun and read option run game to arena football. And with some success. Winning their debut handily, and then competing to the final minutes in two losses since, the multi-faceted quarterback Dak Britt is accurate in the red zone, and is also the league’s leading rusher at over 70 yards per game, a huge number in arena ball. He is all but impossible to stop inside the opponent’s 10 yard line. Proving the other run option is fullback Adrian Ferns who ranks third in the CAFL in rushing yards. The home team in this Super Series stop, the Power have perhaps the league’s strongest roster – on paper. And they lost by paper thin margins, in the final minute, in each of their first two games. Last week, they powered away from Dalian for a huge halftime lead and then played clock control to win their first game handily. With veteran JJ Raterink throwing to 6-6, 240 pound receiver Levasier Tuninei, a former Rose Bowl MVP out of Oregon, and keeping the defense honest with rampaging fullback Dashawn Johnson (6-4, 315) this team may still make it to the big game. Newer → CAFL Super Series – Makes History in China, then Breaks the Internet!